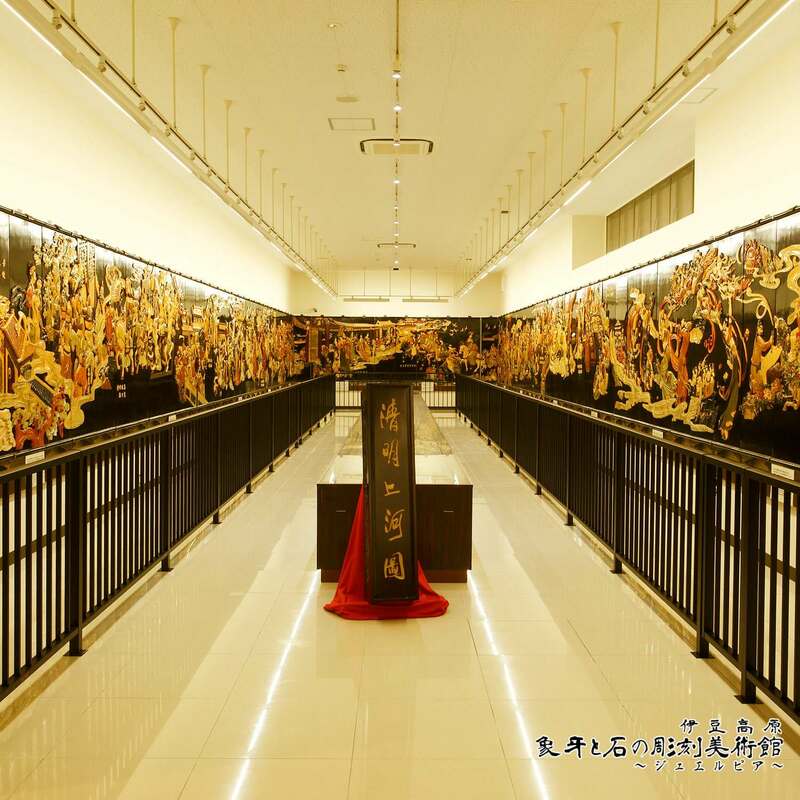 It consists of 75 meters of natural stone inlay big folding screen and 108 folding screens.Over 1500 kind of natural stones are used. Yang-gui-fei's half of lifetime is shown by 19 scenes based on "Bai Juyi's The Song of Everlasting Regret/Sorrow". 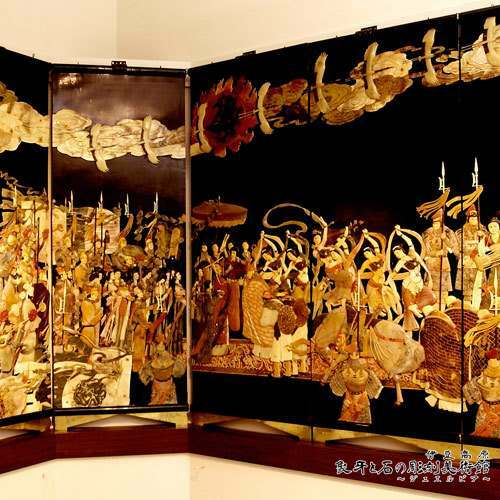 It was produced with various gems and stones sculpted and combined. All colors were made with the natural colors and the designs of stone. 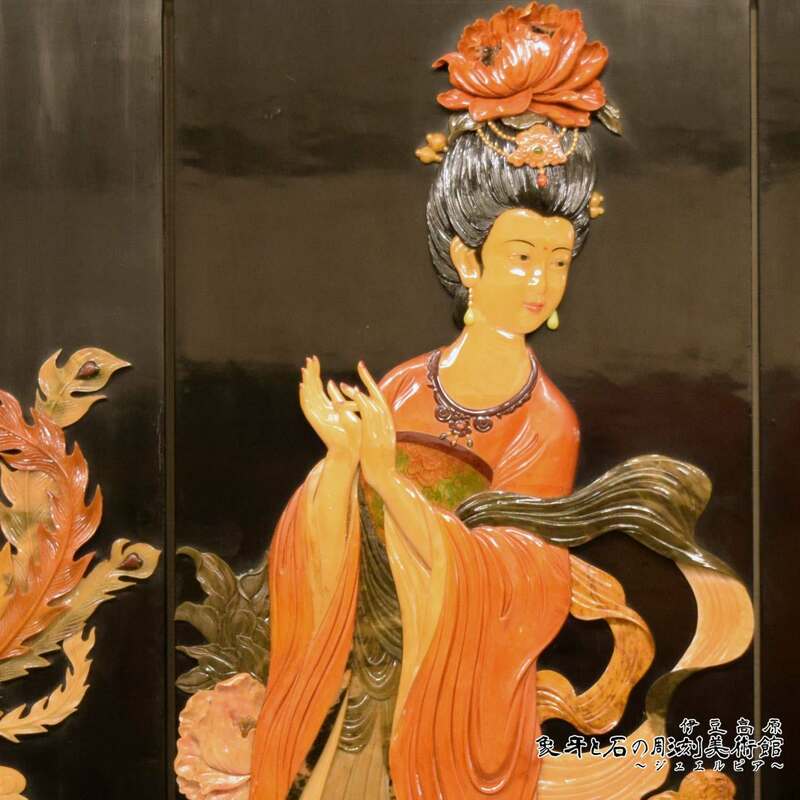 The workmanship of Yang-gui-fei's fingertip, skin, clothes and hair ornament are expressed as not stone, fascinatingly gentle and lustrous. introducing one scene. The scene, Yang-gui-fei greeting Xuan-zong-di and Consort Wu. Yang-gui-fei grew beautifully and was received as Xuan-zong-di's 18 princes and legitimate queen of Li Mao by 16 years old in 735AD. It was said to be the Cinderella story for marrying king which was a Crown Prince candidate. 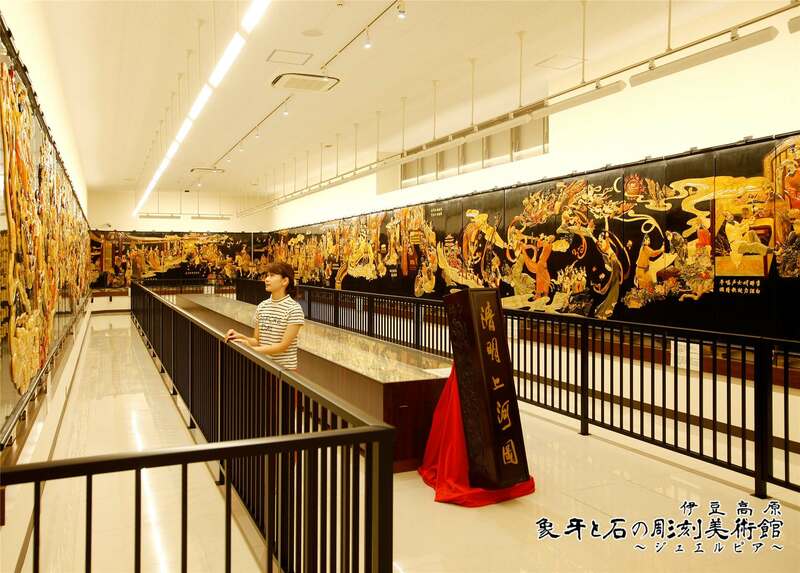 This folding screen is 2.5m height and 50m in length which might be the world's largest continuous folding screen. It's using the more than 1500 kinds of natural stone which were collected from all over China in period of 2 years. 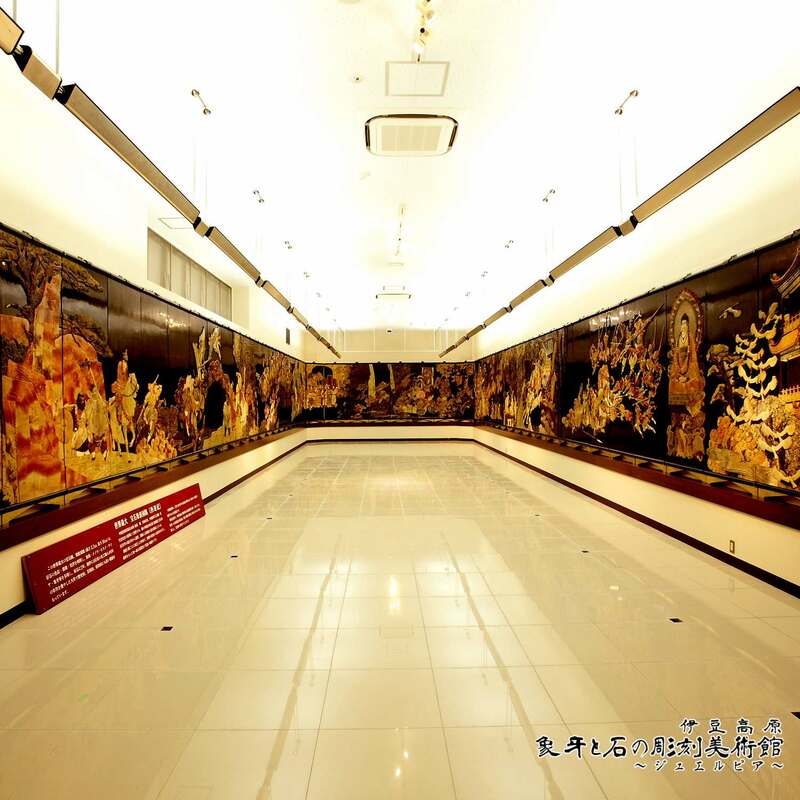 this epic art piece is made by 160 craftsmen and took over 8 years of time to produce. Subject is Chinese famous story "Journey to the West" which is also popular story in Japan, it has been drawn as a folding screen picked 10 scenes from among the many episodes. In order to obtain sutra of Buddhism, The monk Xuanzang started journey to Tianzhu for meeting the original buddha . 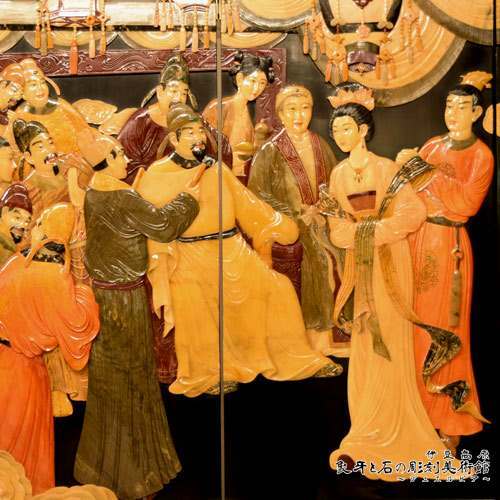 It is a scene of the Xuanzang sending-off by Taejong emperor and Changan people in Tang . Blade of the spear is made of ivory. Jades , diamonds , pearls are used for the ornaments of Taejong and lady's jewelry. 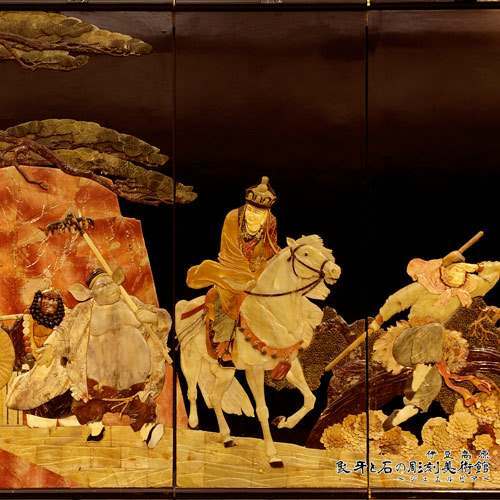 The scene which The monk Xuanzang receives 3 pupils (Sun Wukong, Zhu Bajie and Sha Wujing) and leaving for Tianzhu. From the right, Sun Wukong, The monk Xuanzang, Zhu Bajie and Sha Wujing. Please pay attention to Sha Wujing. A man who wears a mustache, not a Kappa(Kappa is monster of Japanese folklore not greek alphabet). 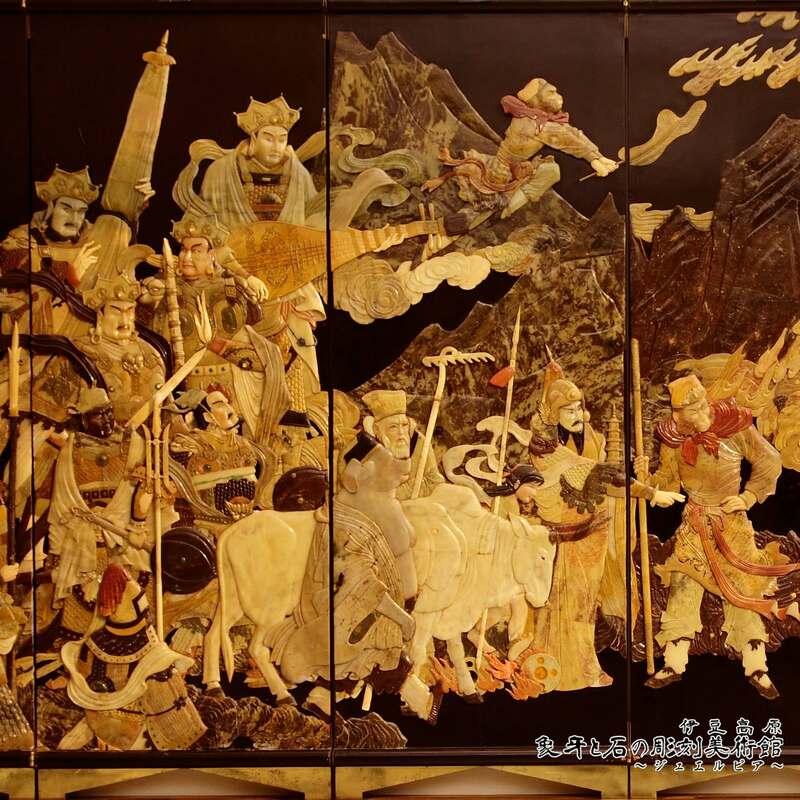 In China, Sha Wujing was the ghost with a pale and dark face who had loose and disheveled hair and worn a necklace of skulls who attacked Travelers with a river of quicksands . In Japan, a quicksand is mistaken with a river and Sha Wujing was handled as a Kappa. The letter "象"zou meaning is "to be modeled".The letter "嵌" kan means "to put in". There are goldsmith inlay, carpenter inlay and Sue inlay, etc. by the meaning to say that the meaning of the inlay origin puts the heterogeneous material in one of material. You assume goldsmith inlay in it was born in Damascus in Syria and that transmitted to Japan in the Asuka period via the silk road. An excellent craftsman was born as a lot in Kyoto in the Edo Period, and displayed their skills in manufacture of a Japanese sword, armor, a mirror, a netsuke, a letter box and a nest of boxes. Colored wood, bone particle, shell and chinaware as well as metal are used as the material.